The year 2016 for Abundant Life Missions Guatemala has been filled with great experiences and adventures. Along with seeing growth in many ministries we also have faced some setbacks. The Lord has used every situation to correct, strengthen, and guide the work that it may glorify Christ. Everything from baptizing new converts to cleaning up after a hurricane has proven to be a great teacher for the ministry. We rejoice in the opportunity to continue as the Lord leads. This year we have seen tremendous growth in our central church where we pastor. We find many here that have a religious background or lifestyle but sadly do not have a relationship with Jesus Christ. Glory be to God to those that have come to Christ this year with true brokenness for their sins. We have seen lives delivered from drugs, alcohol and the things of this world. With each new believer, they come asking us to baptize them. We gather at the lake and they go under the water. What a joy upon their faces! After they are baptized, they start to take part in the services. This is a great blessing to them and us as well. We're so thankful to have more help in the church. Each week there are two or three different groups going out to visit and evangelize. Praise the Lord we now have need to purchase more chairs because of the growth and continue welcoming of visitors. We recently held a conference at our church. We invited all of the churches of the ALT mission in addition to the churches surrounding the area. We want unity among the brethren. The theme was "How to win more souls to Christ". It was an event that lasted all day with teaching and preaching. We also had a time of food and fellowship. 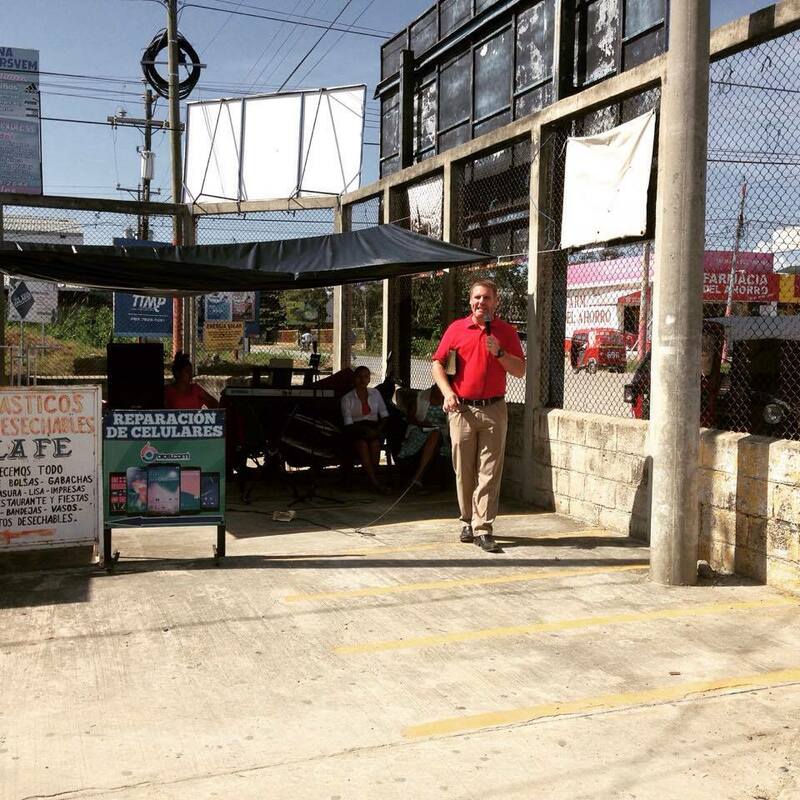 As a result, we were able to take our youth, for the first time to do open air preaching in the market. It was a great blessing and we expect to see even more souls as a result of those teachings! We finished up this year rejoicing for all that God has done in us, in our church and in the mission here in Guatemala. We gathered the pastors for the annual Christmas dinner and had a time of food, fellowship and gifts. We gave thanks for all that God has done in 2016 and also made plans for 2017. We're excited to see all that God will do in this upcoming year. Thank you for all your love and support. Please continue to pray for us as we follow His will for the work in Guatemala. "May the lamb that was slain receive the glory of his suffering"